Commissioned by The Henry Moore Institute by Dr. Penelope Curtis. The research output utilised the format of a publicity campaign to propose the re-instatement of Epstein’s BMA sculptures on The Strand, London, wilfully damaged in 1935. Following archival research at the HMI, Courtauld Institute, The Third Campaign was launched with letters addressing the owners of the works now, as well as academics, journalists, art historians and national heritage bodies with links to the previous campaign by Epstein to save the works in 1935. Correspondence from eminent figures and institutions was received. 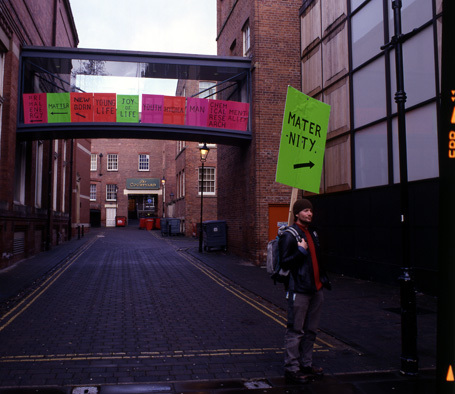 A film of the picketing of the Zimbabwe Embassy by the artist on the site of the works at Strand, along with correspondence and images from the archive of the original works in Epstein's studio were displayed in the exhibition. The project, proposed as a false archive, played on a controversial moment in British art history in order to question the nature of artists interventions into archives, and the relation of the art historian to inherent tensions between preservation and restoration of the artifact. The work has now been acquired by HMI and is available in Leeds. Preparatory drawings were purchased for the HMI collection. The work was also exhibited as part of IDEA, a Goldsmiths Curating Course output at the ICA in June 2005. Further disseminated; Article by Neal White for Henry Moore Institute Newsletter, Dec 2004; Article by Penelope Curtis for Henry Moore Institute Newsletter, Feb/March 2005; Interview with the artist by curator Sophie Olfers at HMI – jan 05; Artist talk on Public Sculpture at ICA, London, Mar 2005; Cited in ‘Appropriation’, Artlaw article in Art Monthly by Henry Lydiate (AM285 2005); Interview on Front Row, BBC Radio 4 with Richard Cork 06 Jan 05 and further by HMI archivists and Director in talks about the HMI archive.